A Sunday evening of stillness and wood pigeons cooing, magpies skirting low over fields, raking the freshly turned soil. Flutters of sparrows, easily startled, gorge on seeds, while crickets chirp. Flies drone and the hedgerows speak of the coming autumn: ripening sloes, chestnuts swelling and the first turnings of bramble and elderberry to deepest purple. In a field, late stragglers of poppies defy the season. On the chalky grasslands, nestling amongst the ant hills, the delicacy of harebell and cornflower strikes in the palest of blues. 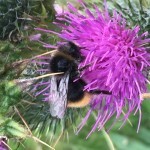 Bees silently sup on thistle nectar. Pigeons glean the stubble plains, which as the sun begins to fall, take on a Keatsian rosy hue. I’ve walked from Chinnor, crossing the Ridgeway, through the beech woods above Wainhill and down to Bledlow, where the remnants of Victorian watercress beds can still be deciphered, and past the cosy Lions inn. 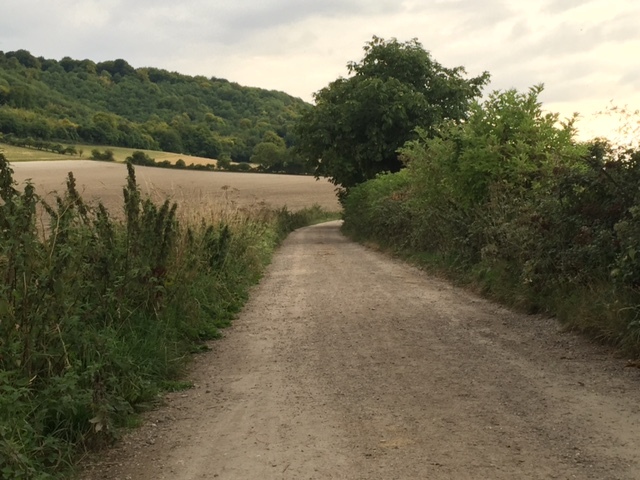 It’s a landscape rich in history: from the lime kilns and cement works – now gone, though the scars of the quarries leave deep chasms to the south of Chinnor – to the ancient Icknield Way that clings to the edge of the Chilterns, here the dividing line between wooded hill and field below. It’s a changing landscape, too. 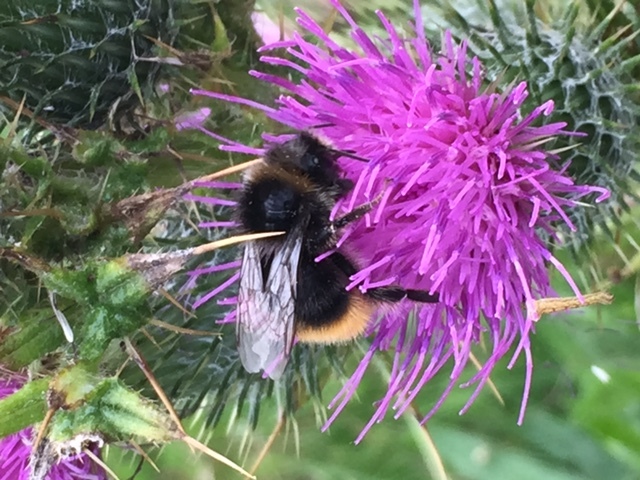 The Wildlife Trust has much improved the nature reserve through careful felling of trees and management of the chalk grasslands, restoring a landscape once being lost to scrub. At the top of the hill, the escarpment clear of trees, the view extends to Didcot, beyond the River Thames, to Beckley and the Otmoor, that curiously empty tract of land between Oxford and Bicester, and the Vale of Aylesbury. On evenings like this, it’s almost as if half of England is to be seen. Such English landscapes are what enchanted Edward Thomas. Long dismissed as a minor war poet, today his position as a poet is unquestioned. Popularly, he is known best for ‘Adlestrop’, a glorious evocation of an England fading but a celebration, too, of something transcendent. Those who have read him know that a deep darkness of soul haunts his poetry. But for me the draw is Thomas’s prose. Thomas wrote it largely to make ends meet. It came out of his great walks and cycle rides across England. But it speaks of a deep concern – seen often in his poetry – for landscape and the preservation of what Thomas saw was vanishing. A hundred years later, Thomas needs to be read more than ever. Too many old inns have closed. Suburbanisation – a threat in Thomas’ day – continues to eat away at our rural heritage. House building continues apace in villages such as Chinnor – but with houses that few who grew up there could ever afford. Much of the agriculture is monoculture, stripping the soil of its fertility. But nights like these remind us that somewhere, ‘farther and farther’, it’s not over yet. Pump, orchard and wood pile stood. Blue china fragments scattered, that tell the tale. Matthew Hollis on Edward Thomas’s ‘Adlestrop’; Hollis’s biography of Edward Thomas, focusing on his development as a poet, Now All Roads Lead to France is outstanding. Photos for once actually taken by me!